A new report has shown that lack of access to clean energy and secondary school education attainment has remained part of the biggest contributors to acute poverty in Zambia in 2014. The report published today by ZIPAR states that many households relied on unclean energy such as charcoal, wood and cow dung to meet their cooking energy needs. The report also shows that many people, especially those heading households in Zambia have not attained secondary education. The report indicates that in Zambia, poverty is traditionally measured and understood from the perspective of money or income. “People living in poverty are those who fall below a pre-defined income or expenditure threshold commonly referred to as a poverty line. The current poverty line stands at US$1.90 a day internationally,” it says. However, the Researchers argue that in reality, poverty is about more than just money, incomes or expenditures. The poor do not only lack money, but other important basic needs and services whose absence may impact negatively on their well-being. “Often overlooked, but just as important is the ability to satisfy hunger or access sufficient nutrition. Other important aspects poor people lack are access to treatment for curable diseases, adequate clothing, shelter, clean water or sanitary facilities such as clean toilets,” the report said. To address the scale of the poverty challenge in Zambia, the ZIPAR report proposes an additional approach to measuring poverty which provides another picture of the poverty situation in Zambia. This approach is multidimensional in nature, which means it considers additional poverty indicators alongside the traditional income approach. The report highlights some of the important aspects of human needs and the extent to which the population are lacking in them. These basic human needs include health, education and living conditions. In this regard, the poor are those who have no access to basic human needs such as health services, education, shelter, clothing, clean water and toilets. All this while lungu hires jets to NY with musicians to go and party. All this while the PF abuse GRZ funds campaigning. Are Zambians so dull that they needed a think-tank to tell them the obvious? I expected a think tank to tell me that they have scientific proof that the earth is actually flat as earlier thought during the bible times or that an atom is not only made up of electrons, protons and a nucleus but also has a zectron. Do any of the members of the PF government understand the term poverty reduction? Giving people goats is not the answer. Investing in women and girl education is one of the most effective ways of reducing poverty and their genuine right. Development is not sustainable if it is unequal in a sense that politicians can afford to drive a Mercedes and wear suits worth more than the very goats shown in this picture. 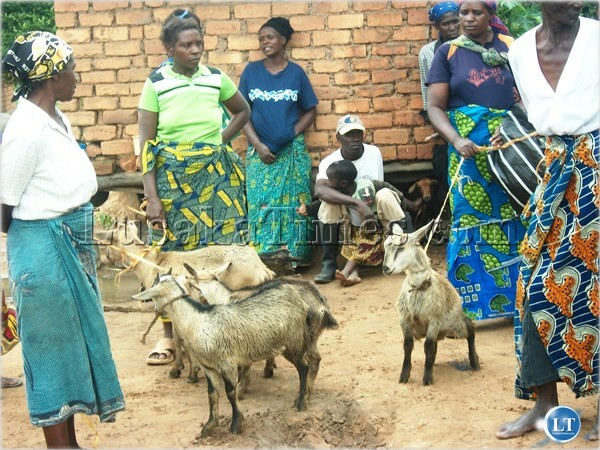 What is this a photo op that PF gave goats? This is not only embarrassing for the PF government but shows arrogance that they can throw a few goats and assume all is well and not care for the most vulnerable sector. Compare chartering a jet to go get drunk while attending celebrations or building a fully equipped school that can benefited society as a whole.